The Annual Percentage Yield is a percentage rate that reflects the total amount of dividends to be paid on an account based on the dividend rate and frequency of compounding for an annual period. For Holiday Club, Health Savings, Money Market Savings, EzStart Savings, Ez$ Savings, Personal Checking, and Business Checking accounts, the Dividend Rate and Annual Percentage Yield may change monthly as determined by the Credit Union’s Board of Directors. For Regular Savings, Secondary Savings, and IRA Savings accounts the Dividend Rate and Annual Percentage Yield may change quarterly as determined by the Credit Union’s Board of Directors. The Dividend Rates and Annual Percentage Yields are the prospective rates and yields that the Credit Union anticipates paying for the applicable dividend period. 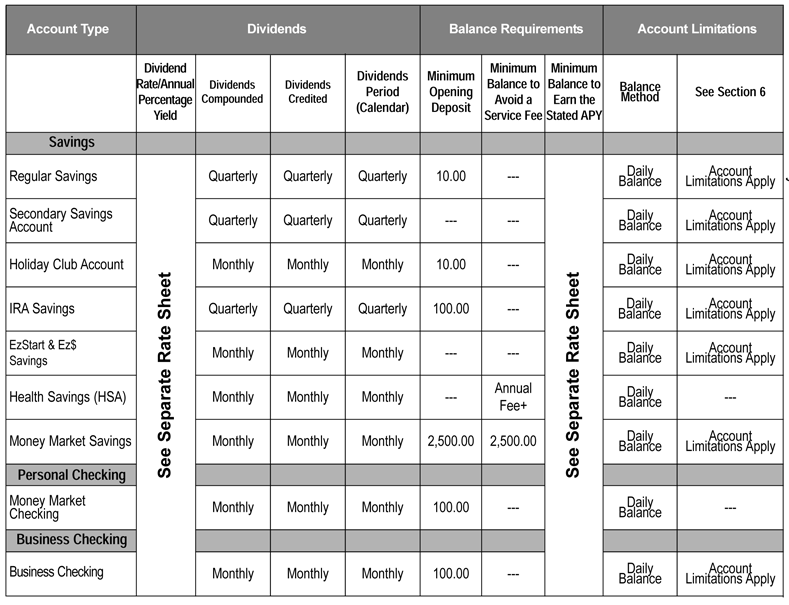 The Money Market Savings account is a Tiered Rate account. If your Daily Balance is $2,499.99 or less, the first Dividend Rate and Annual Percentage Yield listed for this account in the Rate Schedule will apply. If your Daily Balance is from $2,500.00 to $9,999.99, the second Dividend Rate and Annual Percentage Yield listed will apply. If your Daily Balance is from $10,000.00 to $24,999.99, the third Dividend Rate and Annual Percentage Yield listed will apply. If your Daily Balance is from $25,000.00 to $49,999.99, the fourth Dividend Rate and Annual Percentage Yield listed will apply. If your daily balance is $50,000.00 to $99,999.99, the fifth Dividend Rate and Annual Percentage Yield listed will apply. If your Daily Balance is from $100,000.00 to $249,999.99, the sixth Dividend Rate and Annual Percentage Yield listed will apply. If your Daily Balance is from $250,000.00 to $499,999.99, the seventh Dividend Rate and Annual Percentage Yield listed will apply. If your Daily Balance is $500,000.00 or greater, the eighth Dividend Rate and Annual Percentage Yield listed will apply. Once a particular range is met, the Dividend Rate and Annual Percentage for that balance range will apply to the full balance of your account. The Health Savings account is a Tiered Rate account. If your Daily Balance is $2,499.99 or less, the first Dividend Rate and Annual Percentage Yield listed for this account in the Rate Schedule will apply. If your Daily Balance is from $2,500.00 to $9,999.99, the second Dividend Rate and Annual Percentage Yield listed will apply. If your Daily Balance is from $10,000.00 to $24,999.99, the third Dividend Rate and Annual Percentage Yield listed will apply. If your Daily Balance is from $25,000.00 to $49,999.99, the fourth Dividend Rate and Annual Percentage Yield listed will apply. For Health Savings Accounts if your Daily Balance is $50,000.00 or greater the fifth Dividend Rate and Annual Percentage Yield listed will apply. Once a particular range is met, the Dividend Rate and Annual Percentage for that balance range will apply to the full balance of your account. The EzStart Savings and Ez$ Savings is a split rate account. If your Daily Balance is $5000.00 or less, the first Dividend Rate and Annual Percentage Yield listed for this account is at the EzStart and Ez$ Savings Dividend Rate and Annual Percentage Yield as disclosed within our current rate sheet. If your Daily Balance is $5000.01 and over, the second Dividend Rate and Annual Percentage Yield listed for this balance will apply. Dividends are compounded and applied on a monthly basis. The Personal Checking and Business Checking accounts are Tiered Rate accounts. If your Daily Balance is from $1,000.00 to $9,999.99, the first Dividend Rate and Annual Percentage Yield listed for this account in the Rate Schedule will apply. If your Daily Balance is from $10,000.00 to $24,999.99, the second Dividend Rate and Annual Percentage Yield listed for this account will apply. If your Daily Balance is $25,000.00 to $49,999.99, the third Dividend Rate and Annual Percentage Yield listed for this account will apply. If you Daily Balance is $50,000.00 or greater, the fourth Dividend Rate and Annual Percentage Yield listed for this account will apply. Once a particular range is met, the Dividend Rate and Annual Percentage Yield for that balance range will apply to the full balance of your account. 3. Dividend Compounding and Crediting. The compounding and crediting frequency of dividends and dividend period applicable to each account are stated in the Rate Schedule. The Dividend Period is the period of time at the end of which an account earns dividend credit. The Dividend Period begins on the first calendar day of the period and ends on the last calendar day of the period. For all accounts, dividends will begin to accrue on noncash deposits (e.g. checks) on the business day you make the deposit to your account. If you close your account before accrued dividends are credited, you will not receive the accrued dividends. However, for Holiday Club accounts, any accrued dividends will be paid if you close the account within seven (7) days of the date you open it. To open any account, you must deposit or already have on deposit at least the par value of one full share in a Regular Share account. The current par value is $10.00. Some accounts may have additional minimum opening deposit requirements. The minimum balance requirements applicable to each account are stated in the Rate Schedule. If the minimum daily balance is not met each day of the dividend period, you will not earn the stated Annual Percentage Yield. For accounts using the Daily Balance method as stated on the Rate Schedule, dividends are calculated by applying a daily periodic rate to the balance in the account each day. For Regular Share, Secondary Savings, ***IRA, and Money Market Savings, EzStart Savings, Ez$ Savings accounts (A Savings is classified as a non-transaction account), no more than six (6) pre-authorized, automatic, or telephone transfers may be made from each account to another account or to a third party in any month. If you exceed these limitations, your account may be subject to a fee or be closed. Your account may be closed if the balance is zero (0) with no activity for six (6) consecutive months. *** There are no ACH withdrawals permitted on an IRA; therefore, they are excluded. For the EzStart Savings the member must be 0-14 years and have eStatements. For the Ez$ Savings the member must be age 24 and under, have an active checking account, debit card and eStatements. Active checking is defined as having at least (3) transactions occurring within the checking account each month. **A transaction is defined as the following: PIN or Point of Sale transaction with the use of a Debit Card, ACH transaction, cleared check transfer, deposit and/or direct deposit within the account. For Holiday Club accounts, the entire balance will be transferred to your savings account on or after November 1st each year and the account will remain open. If you withdraw funds from your account, the account will be closed and you may have a penalty of dividends that have been or would be earned on the account for the year. However, no penalty will be charged if the withdrawal occurs within seven (7) days of the date the account is opened. In addition, for Holiday Club accounts, you must establish automatic transfer or direct deposit arrangements in order to open an account. For Business Checking, the first 500 transactions per month are free and over 500 are $.10 each. Transactions are checks, ATM withdrawals, debit card purchases, teller withdrawals and automatic payments. May be associated with a Health Savings Account (HSA), IRA, and/or EzStart Saving accounts, see the Fee Schedule for further details. Fees may be imposed on each check, draft, item, debit card withdrawal, debit card point of purchase, preauthorized automatic debit, telephone initiated withdrawal or any other electronic withdrawal or transfer transaction that is drawn on an insufficient available account balance. If you opted in to having your ATM/debit card withdrawals and one-time debit card point of sale purchases covered if you have insufficient funds available, you may incur fees on each of those transactions also. The entire balance in your account may not be available for withdrawal, transfer, or paying a check, draft, or item, or authorizing a ATM/debit card transaction. You may consult the Funds Availability Policy for information regarding the availability of funds in your account. Fees for overdrawing your account may be imposed for each overdraft, regardless of whether we pay or return the draft, item, or transaction. If we have approved an overdraft protection limit for your account, such fees may reduce your approved limit. Please refer to the Fee Schedule for current fee information for all accounts. As a condition of membership, you must purchase and maintain a minimum required share(s) as set with our bylaws. Par Value of One Share is $10.00 and the number of shares required is one (1), each individual with a Primary Share account is allowed one voting privilege during our annual meeting. To qualify for membership an individual must fall within our field of membership. The rates and terms applicable to your account at the Credit Union are provided in this Truth-In-Saving Disclosure. The Credit Union may offer other rates for these accounts from time to time.